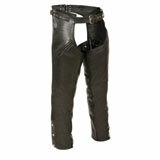 Good quality leather is a time-tested fabric that offers an amazing amount of abrasion protection. 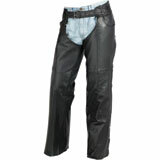 If you go down in an accident, your gear is all you have between you and the road – and pair of standard blue jeans isn’t going to the job. 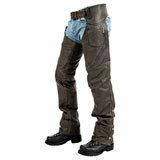 When you wear a well-fitting pair of chaps, you are giving yourself that extra protection that could be the difference from walking away from a crash to being taken away in an ambulance. 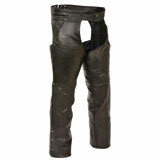 If you want an even greater amount of protection, combine a set of chaps with a pair of quality motorcycle riding jeans. 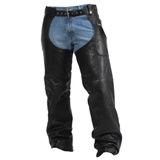 Often equipped with armor and specifically designed to provide reinforced protection in the seat and other high abrasion areas on the pants, motorcycle jeans can be the perfect partner to a pair of motorcycle chaps. 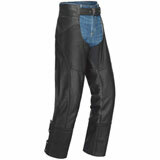 Chaps are also a great way to add comfort to a ride by protecting the rider from other factors you encounter on the road such as wind, weather, heat from the bike, road debris and bugs. 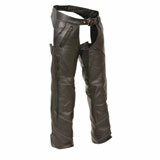 In order to perform at their best, chaps should fit fairly snug against your legs. 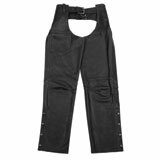 We carry a variety of styles in an assortment of different designs so that you can find something to fit your personal preference and individual style. 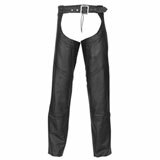 Take a look through our selection of motorcycle chaps to find a quality pair to protect you on every ride from brands like Interstate Leather, Milwaukee Leather, MMCC, River Road and Z1R! 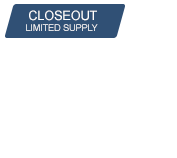 Latest Chaps Reviews – You could win up to $500 for reviewing products!